CLOCKWISE, ABOVE FROM LEFT. PHOTO: COURTESY OF Republic Records; Virgin EMI Records; Capitol Records; Interscope Records. 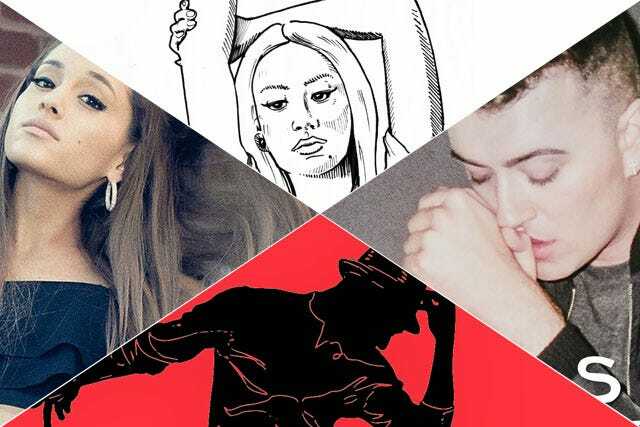 Iggy Azalea ruled Spotify with a perfectly-manicured fist in May. The leggy Australian’s song “Fancy” skyrocketed and with close to three million plays a week, is our most streamed track for the entire month in the US. Whether it’s the Gwen Stefani-esque chorus (sung by Charli XCX) or Azalea’s brashness, “Fancy” is appealing to listeners of all ages and could well be a lock for song of the summer (But, watch out for Calvin Harris’ “Summer” — it’s taking the slow and steady route with 55 million streams and counting). May saw a meteoric rise for diva-in-the-making Ariana Grande thanks to the popularity of her Iggy-assisted single “Problem.” This song’s only problem right now is that it doesn’t know how to slow down; it's been streamed about 20 million times in the four weeks since its release and is our second-most streamed track of the month. This is grand news for 20-year-old Ariana, who enjoyed a healthy spike in plays after the release of her debut album Yours Truly last year, but has obliterated her own record three-fold in a teeny amount of time and with just one song (not to mention a bit of sauce — seen “Problem’s” cover pic?). Electronic Dance Music (or EDM) is one of the most popular genres with Spotify listeners — Avicii and Calvin Harris stream in the millions each day. But, in hot pursuit is Disclosure, made up of brothers Guy and Howard Lawrence from the U.K. The duo’s dreamy/trippy track “Latch” has advanced mightily from week to week this past month. It doesn’t hurt that it features vocals from from rising star du jour, crooner Sam Smith. In fact, it’s worth checking out Sam’s own acoustic version of “Latch.” It’s gorgeously low tempo and we’ve noticed that our listeners have been eagerly sharing it with their friends. April showers bring May...introspection? This month we saw increased interest in playlists in our “mood” category. The genre covers playlists from coffeehouse favorites (think “Jolene” by Ray Lamontagne) to atmospheric rock to help you focus on worky things (I’m partial to Mogwai’s cruisy song “Jaguar”). But the most popular playlist of the month is decidedly upbeat; “Today’s Top Hits” features more than three hours of music, including must-stream songs like Aloe Blacc’s “The Man” and Tiesto’s tantalizing remix of John Legend’s “All of Me.” We’re keeping our eyes (and ears) on MKTO’s super peppy song “Classic” — it’s close to cracking Spotify’s top ten in terms of streams in America.